How does one learn nonviolent resistance? The same way that Martin Luther King Jr. did—by study, reading and interrogating seasoned tutors. King would eventually become the person most responsible for advancing and popularizing Gandhi’s ideas in the United States, by persuading black Americans to adapt the strategies used against British imperialism in India to their own struggles. Yet he was not the first to bring this knowledge from the subcontinent. By the 1930s and 1940s, via ocean voyages and propeller airplanes, a constant flow of prominent black leaders were traveling to India. College presidents, professors, pastors and journalists journeyed to India to meet Gandhi and study how to forge mass struggle with nonviolent means. Returning to the United States, they wrote articles, preached, lectured and passed key documents from hand to hand for study by other black leaders. Historian Sudarshan Kapur has shown that the ideas of Gandhi were moving vigorously from India to the United States at that time, and the African American news media reported on the Indian independence struggle. Leaders in the black community talked about a “black Gandhi” for the United States. One woman called it “raising up a prophet,” which Kapur used as the title of his book. While a student at Crozer Theological Seminary in Chester, Pennsylvania, King was intrigued by reading Thoreau and Gandhi, yet had not actually studied Gandhi in depth. A friend, J. Pius Barbour, remembered the young seminarian arguing on behalf of Gandhian methods with a reckoning based on arithmetic—that any minority would be outnumbered if it turned to a policy of violence—rather than on principle. The more that King read Gandhi, though, the less he doubted the validity of a philosophy based on “Love,” which in turn was central to his preparation for the Christian ministry. “As I delved deeper into the philosophy of Gandhi,” he later wrote, “my skepticism concerning the power of Love gradually diminished, and I came to see for the first time its potency in the area of social reform.” His serious contemplation of Gandhi’s fundamental approaches for organizing a movement began in Montgomery, soon after becoming pastor at the Dexter Avenue Baptist Church in April of 1954. When Rosa Parks was arrested for refusing to yield her seat on a public bus to a white man on December 1, 1955, JoAnn Robinson, a leader in the Women’s Political Council, worked through the night to organize an action of mass economic noncooperation. King was unanimously elected to lead the Montgomery Improvement Association, which would sustain the boycott of city buses. With the start of the Montgomery boycott, a number of activists, pacifists, reformers, radical Christians and socialists arrived in town. Elated by King, they believed that he could take the fight for justice to a new order of magnitude unlike anything the United States had seen since the abolition of slavery. Among them was 44-year-old Bayard Rustin, 17 years King’s senior, who went on to help King build the Montgomery boycott into a mature campaign. The War Resisters League let Rustin work for King full-time for this assignment. The black community in Montgomery, as elsewhere in the South, was armed, and there was concern that it could turn to violence in the struggle. Rustin was worried that King himself might falter without deeper foundations. Plying him with books at night, he helped him to analyze Gandhi, and was the first tutor to teach King the essentials of nonviolent struggle systematically. In February 1957, at Oberlin College in Ohio, King met a black Methodist minister named James M. Lawson, Jr. Lawson had served 13 months in U.S. federal prison for refusing to cooperate with conscription during the Korean War. While locked up, the Board of Missions of the Methodist Church successfully petitioned the court for Lawson to be handed over to them. They assigned him to teach at Hislop College in Nagpur, India. Arriving there four years after Gandhi’s death, he spent the next three years teaching. He also met numerous individuals who had worked with Gandhi and learned of the Indian campaigns firsthand from participants. King was impressed by Lawson’s background and experience, especially considering they were both just 28 years old. He asked Lawson not to wait to finish his studies to come South: “Come now! You’re badly needed. We don’t have anyone like you!” As I have documented elsewhere, Lawson became a human bridge, connecting knowledge from India to the fledgling U.S. civil rights movement and contemporary struggles. Martin did that at every SCLC meeting as long as he lived. He would ask me to conduct an afternoon workshop, usually two or three hours, and he would arrange for it to be “at-large” so that everyone could attend, with nothing else to compete. He put it on the schedule himself. A few minutes early, he would show up and sit alone, as an example, in the front row. In Nashville, throughout the autumn of 1959, Lawson led weekly Monday-evening meetings in which he and interested students analyzed the theories and techniques that he had encountered in India. His workshops scrutinized the Bible, and writings of Gandhi, King and Thoreau. They practiced test-cases, including small sit-ins. Lawson’s workshops lasted for several months before news broke on February 1, 1960, of the Greensboro sit-ins. Hearing of the Greensboro actions, seventy-five Nashville students followed suit, creating the largest, most disciplined and influential of the 1960 sit-in campaigns. In working with Lawson—who was always calm and self-effacing—the Nashville students were not only being trained by one of King’s own instructors, but they were benefitting from direct acquaintance with Gandhi’s experiments. The sit-ins would give the overall movement its regional reach, and the Nashville students would become a cornerstone of the Student Nonviolent Coordinating Committee, of which I was a part. 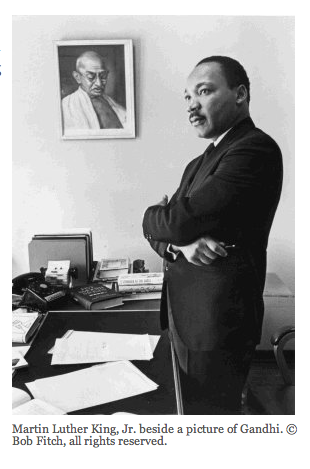 In commemorating Dr. King’s birthday, it is worth remembering that everyone can learn nonviolent action as he did. King may not have invented the nonviolent strategies that he advanced, but he was an apt student, and his understanding of them would in the decades to come encourage other movements on the world stage. He became one of history’s most influential agents for propagating knowledge of the potential for constructive social change without resorting to violence. How he himself learned the theory and practice of civil resistance is a reminder to each of us that these methods are neither intuitive nor spontaneous; they’re a system of logic, skills and techniques that must be learned.